The Vermont Rail System story begins with the ending of another. as the number of trains that would operate. The operational employees immediately reacted by calling a strike. After a court decision was made in favor of the railroad, employees returned to work in November. When the union demanded a pay hike consistent with national settlements, management refused, leading to yet another strike in September of 1961. This time, the Rutland Railroad applied to the Interstate Commerce Commission (ICC) for permission to abandon the line. This unexpected decision immediately caused an outpouring of protests. To close the line was universally felt to be a significant detriment to the continued growth of the State of Vermont. Not only were there many businesses afraid they would need to close because of their dependence upon rail transportation, but hundreds of people would be left unemployed. Governor Keyser began to negotiate with the Rutland Railroad officials. It was his idea that if the Railroad was granted permission to abandon the line, the State might be able to purchase all or part of the Rutland Railroad and then sell or lease the property to a private party. On September 18th, 1962, the ICC ruled that the Rutland Railroad could abandon the entire line. That November, Philip H. Hoff was the newly elected Governor of Vermont. Hoff, much like his predecessor Keyser, was eager to restore rail service on the former Rutland line and immediately sought out to purchase the right of way. By the summer of 1963, the Rutland Railroad officials were anxious to tear up the rails, sell the right of way, and dispose of the corporation's remaining assets. The State was under a lot of pressure to find a buyer or operator for the property. Fortunately, 33-year old Jay L. Wulfson of East Brunswick, New Jersey , became interested in the possibilities of operating trains on the abandoned Rutland line. Jay L. Wulfson had always loved trains since he was just a boy. In fact, he was so enthralled in the industry, that at age 12, he built a small scale working steam engine and model railroad right in his backyard. Just four years later, he attained his steam engineer’s license making him the youngest licensed engineer in the State of New Jersey. Jay's father, Vladimir, owned a dress factory called the Mayfair Dress Company. When Vladimir passed away, he left the family business to Jay, who quickly decided that dressmaking was not how he wanted to spend his future. In 1950, at age 20, Jay decided to sell the Mayfair Dress Company to pursue his passion for railroading. He, along with fellow railroad enthusiast James Wright, created Wright & Wulfson, Inc. 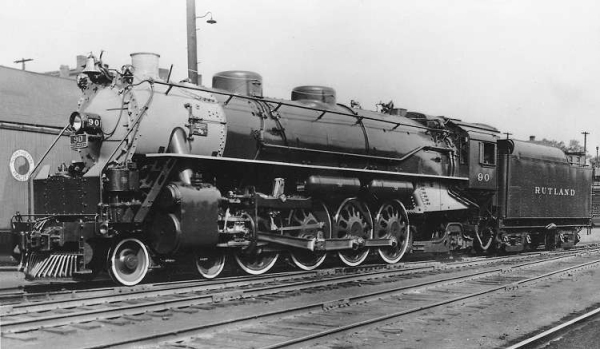 Together they purchased a Baldwin 4-0T engine to become Pine Creek locomotive No.1. In 1952, with the help of Pierre Rasmussen, an agent for the Central Railroad of New Jersey, the Pine Creek Railroad Museum was created. In 1956, Wright & Wulfson were contracted to develop a similar amusement train at Cowboy City on Route 33 in Howell, New Jersey, and they set up a separate company called the Cranberry Creek Railroad, Inc., to build and operate the Copper Creek Railroad, comprising a 1,700-foot loop of track. When Cowboy City started having difficulty paying their creditors, they closed, and all rolling stock returned to the Pine Creek Railroad Museum. In November of 1960, Wulfson, Wright, and Rasmussen purchased the standard gauge Middletown and New Jersey Railroad in Middletown, New York, electing Jay Wulfson as President. When Wulfson found out about the opportunity in Vermont, the challenge of restoring rail service to western part of the State intrigued him. He left the Middletown and New Jersey Railroad, selling his stock and handing his presidency to Rasmussen. 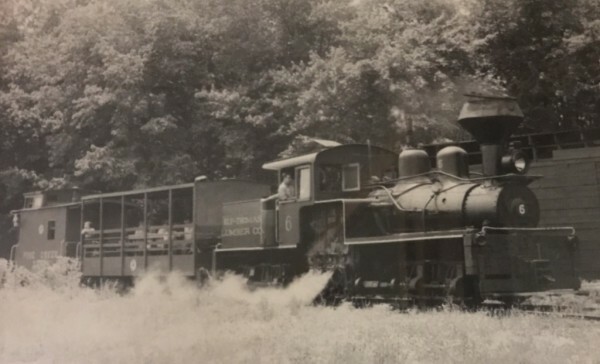 Today, the Middletown and New Jersey Railroad continues to operate freight, and the Pine Creek Railroad was donated to the New Jersey Museum of Transportation which currently operates in Allaire State Park, New Jersey. The Pine Creek locomotive No. 1 was eventually sold to Walt Disney for his California theme park, Disneyland, where it operates today as the Ernest S. Marsh locomotive No. 4. Jay sought out to become familiar with Vermont's territory. He contacted former rail customers and State transportation officials, and exhaustively studied the consultants’ reports, and everything else he could get his hands on that would help him put together a proposal to operate the line. Wulfson, always an insightful and positive-thinking businessman, concluded that he could restore and profit from rail service with proper management decisions, adequate equipment, dedicated employees, and fast, personal and reliable rail service. On August 6, 1963, Wulfson signed a lease agreement with the State of Vermont to begin operations. President Wulfson, along with Vice-President Harold T. Filskov, Charles Bischoff, and an ambitious team of railroaders, set off to run the Vermont Railway (VTR), the nation's first privately-owned railroad operating on a publicly-owned right of way. Soon after, Jay’s wife, Joan Wulfson, left East Brunswick with their four kids, and a collie dog in a station wagon to drive overnight to meet him in their new home State, their oldest son was only five years old. “One of the first things we did was take an engine with a caboose, and went from Burlington to Bennington,” Joan Wulfson said, as she reminisced during an interview for the companies 50th anniversary. “People would come out running — they hadn’t seen a train in so long — and so we were waving all the way from here (Burlington) to Bennington. 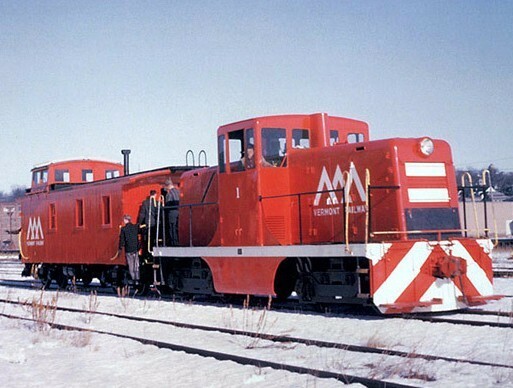 It was a fantastic day.” Bright Red took over the rails on January 6th, 1964, as a modest GE 44 tonner and caboose began their first day of operations in the Burlington Yard. By the end of the day, it was clear that VTR’s future was as bright as its fiery paint scheme. Plans were already in place to add additional motive power. 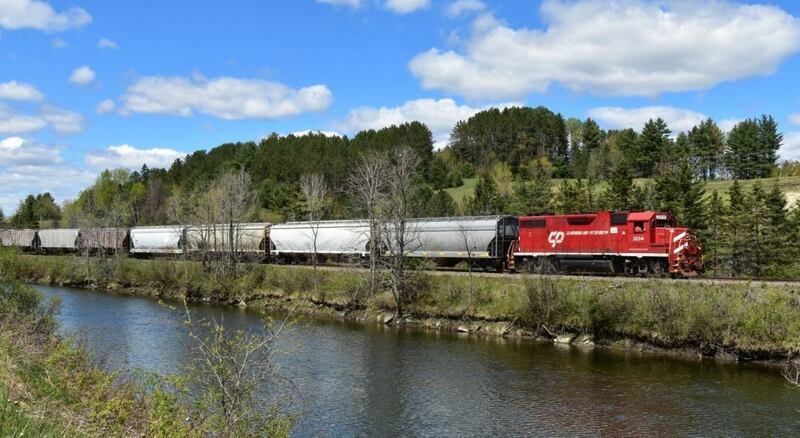 With daily freight trains operating between Burlington and Rutland, and tri-weekly service between Rutland and North Bennington, VTR set out to restore freight traffic along Vermont’s Western Corridor with a strong commitment to customer service. In 1965, the VTR became involved in the piggyback trailer service (loading truck trailers onto flat cars to be shipped by rail). Ramps for loading and unloading trailers were constructed in Burlington, Rutland, and North Bennington. Jay had even worked with manufacturers to help design a trailer that could withstand freight train movement as this concept was still new to the industry. The company's piggyback traffic continued to grow, and by 1974, more than 10% of the road's traffic was trailer-on-flatcar. Wulfson and Filskov realized that more money could be made by leasing their trailers. At one time the VTR had more than six thousand Fruehauf and Trailmobile trailers, which made it the seventh largest fleet in the country. With the extra revenue generated from their trailer business, the Vermont Railway was able to purchase a brand new EMD SW 1500 locomotive No. 501 in September of 1966, and in 1972 and 1974, they purchased two brand new EMD GP38's No. 201 and No. 202. This was a huge deal considering that it was absolutely unheard of for a shortline railroad to purchase a brand-new engine, let alone three brand new engines. ALL RIGHTS RESERVED - TM, ®, COPYRIGHT © 2019 - Vermont Railway, Inc. In November of 1972, the VTR purchased the Clarendon & Pittsford Railroad (CLP) from the Vermont Marble Company. The CLP serves the substantial ultra-modern limestone processing plant on the mountainside above Florence, Vermont, on a daily basis. OMYA soon became (and still is) the railroads biggest shipper. The local facility produces finely ground limestone that is used in the manufacturing of products such as paint, plastics, paper, automobile parts and floor tile. During the first ten years of operations, the Vermont Railway's net earnings held steady at about $18,000 per year, with some increases in subsequent years. All profits were put back into the business. of 1983, the Clarendon & Pittsford purchased the Delaware & Hudson line between Rutland and Whitehall, New York. The 24-mile line soon became substantial to the shipping of fuel oil and gasoline through the CLP's main interchange point in Whitehall, NY. In the fall of 1978, Harold Filskov was admitted to the hospital for what they presumed to be a heart condition. There, he was diagnosed with cancer. Although he pursued this courageous battle for nearly a decade, the long-time Vice-President and General Manager was unable to return to work on the railroad. Around that same time, Jay Wulfson was stricken ill in Texas while attending a conference of short line officials. ​Jay was able to recover enough to return to work, but sadly, he passed away in November of 1980. 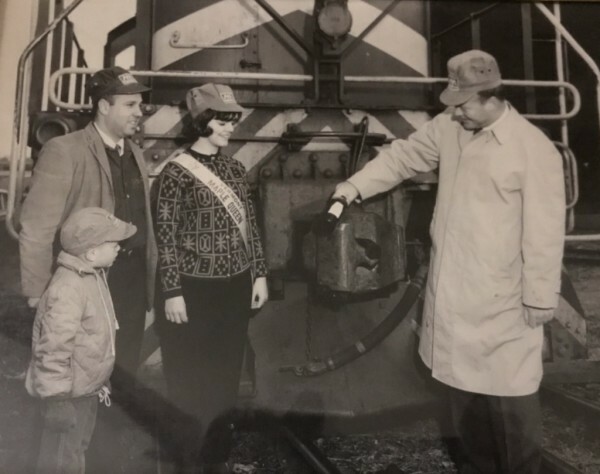 Jay Wulfson’s unique, innovative, and logical approach to running a railroad has not been lost on his family, employees, customers, state officials, and the railroad industry. Together they accomplished, as Jay used to say, "What the consultants' reports said we couldn’t do." When Jay Wulfson passed away, the board of directors, of which his oldest son David (age 22) was elected chairman, appointed John Pennington as President, and David as his Assisting Vice-President. At this time, other officers included David Ploof; Director of Traffic; Charles Bischoff, Vice-President of Operations; Fred Larose, Superintendent of Car & Trailer Repairs; and Jed Martin III, Vice-President of Equipment. Soon after, Jed Martin III retired, and his two sons took over; Jed Martin IV, Chief Mechanical Officer; and Paul Martin, Superintendent of Motive Power. In the early 1980's, David's three siblings, as well as Harold Filskov's son, Robbie, assumed supervisory capacities within the company. David had been working with his father on the railroad since he was a young boy. He assumed Presidency when John Pennington retired in 1999. 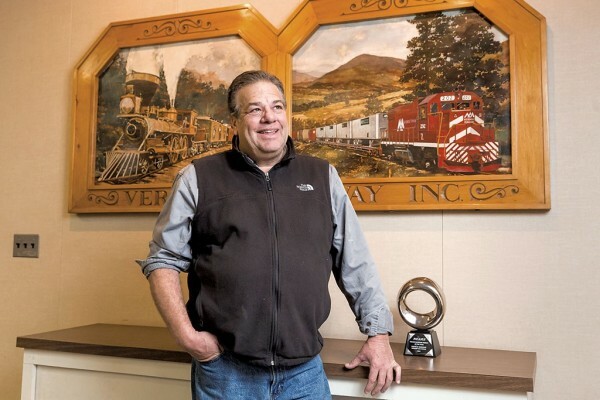 Today, David continues to lead the Vermont Rail System under the motto that his father instilled in him, to "never ask your employees to do anything that you wouldn't do yourself." Because of this, he is a very well-respected businessman, as his father was. David's sister, Lisa Wulfson, came back to the railroad after graduating college in 1982. She is currently the Executive Vice-President & Treasurer. Mary Anne Michaels has been part of the VRS family since 1999 and is currently Chief Financial Officer. 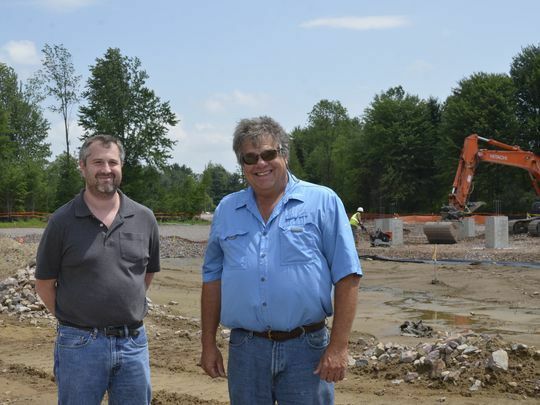 Gary Wulfson created an excavating business that works closely with the Railroad. 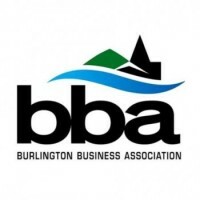 Todd Wulfson became a CFA and co-owns a private investment advisory firm in Burlington. Robbie Filskov's son (Harold's grandson), Shane Filskov, became (and is currently) the General Manager, and is the fourth generation in his family to work in the industry. This new team would lead the Vermont Railway to its prosperous future. 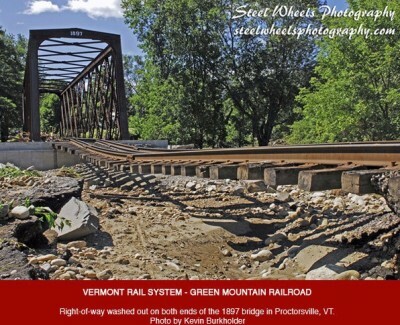 The Vermont Railway's purchase of the Green Mountain Railroad (GMRC) from president and significant stockholder Jerome Hebda in May of 1997, lead to the formation of the Vermont Rail System (VRS). At the time of the sale, the GMRC was well run, was operating with a lean and efficient staff, had a solid traffic base, and was debt free. Although the company had plenty of capital, there was never enough to keep up with the deteriorating track conditions. Slow train speeds and derailments became a costly and limiting factor to traffic growth. David Wulfson and Jerome Hebda worked together for many years. The VTR would lend the GMRC equipment and would help them whenever they could. The partnership between the two railroads grew into the opportunity to merge as one. The VTR was able to provide a strong maintenance-of-way policy with modern equipment and skilled employees to operate the GMRC more efficiently, which helped to improve business on the line. Hebda became a VRS Vice-President and moved to the company's headquarters in Burlington. Later, three more rail lines would join the Vermont Rail System. In September of 1999, the VRS began operations on the Washington County Railroad Montpelier & Barre Division (WACR). The line was formerly operated by the New England Central Railroad (NECR) and was struggling severely from the loss of so many customers. In April of 2002, the New York and Ogdensburg Railway (NYOG) joined the Vermont Rail System. The NYOG consists of 31.2 miles of track between Norfolk and Ogdensburg, New York, and was a part of the former Rutland Railroad. Jay Wulfson always had his sights on purchasing this line in the future of his company. When the NYOG joined the VRS, the surviving Rutland Railroad rails were finally reunited under the same operator. In 2003, the WACR expanded to another line between White River Junction and Newport, Vermont. The VRS affiliate immediately went to work providing regular service and making a concerted effort to win back previous customers and gain the trust of new ones. Three months later, the State of Vermont named the WACR (VRS) as permanent operator of the entire line. This section was the most recent addition to the Vermont Rail System, who later named the line, the Washington County Railroad Connecticut River Division. 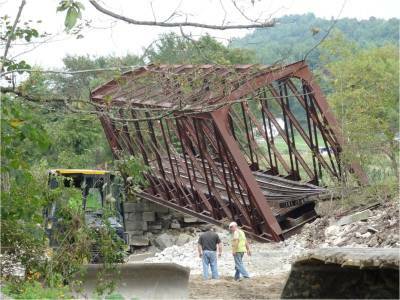 In 2012, the Vermont Rail System was honored by Railway Age Magazine, with the "Shortline of the Year Award" for their efforts in helping restore Vermont after Hurricane Irene tore through the State in August of 2011. Hurricane Irene was the most catastrophic storm to occur in Vermont's History. Houses were washed away, businesses demolished, irreplaceable personal items lost forever. Flooding destroyed roads and bridges, it decimated farms, and railroads were forced to shut down from damage. 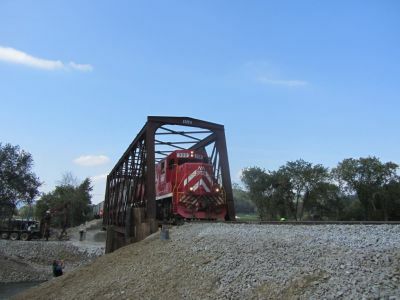 With the hard work and dedication of more than 250 men and women from the VRS, six different contractors and engineering firms, several vendors, the Vermont AOT, and neighboring railroads, they were able to repair over 100 washouts and six severely compromised bridges throughout the VRS, in the span of only three weeks. VRS crews worked tirelessly around the clock, from the beginning to the end. Their efforts during Irene strengthened their bond tremendously, not only with each other but with local businesses alike; especially the Vermont AOT (photos and details of the amazing Hurricane Irene recovery here). The community undoubtedly earned the title of "Vermont Strong." David has spent the last few years grooming the path for the next generation of railroaders. As President of the family business that he grew up into and spent his entire life working toward, the thought of handing the company over to someone new was difficult for David, until Selden came along. ​​ Selden Houghton started his railroading career at age 16 on the Lamoille Valley Railroad. At age 22, he worked part-time at the Vermont Rail System between semesters at Clarkson University. After he earned his B.S in Computer Engineering, he worked at IBM while maintaining his part-time position at the VRS. At age 24, he took a full-time position at the VRS as IT Manager.​​ Selden, just like David, would look for opportunity and jump into it head first. He showed leadership qualities from day one, always stepping up when help was needed no matter what it entailed. His work ethic and desire to learn everything and anything that he could was evident, and with that, David built trust and confidence in Selden. After his outstanding efforts during the Hurricane Irene recovery, and numerous efforts after that, Selden began to work closely with David to prepare for his position as Vice-President, which he attained in 2017. David Wulfson has put his full confidence in the next generation to lead his company into the future. Today's VRS leaders include Selden Houghton, Vice-President; Shane Filskov; General Manager; James Mattsen, Assistant Vice-President of Marketing & Customer Service; Charlie Lemieux, Chief Engineer; and George Zwolen, Chief Mechanical Officer. Today the VRS operates over 350 miles of track via the Green Mountain Railroad, Washington County Railroad Connecticut River Division, Washington County Railroad Montpelier & Barre Division, New York and Ogdensburg Railroad, Clarendon & Pittsford Railroad and the Vermont Railway. The company now has a family of over 150 dedicated railroaders. The VRS operates passenger services under the Green Mountain Railroad, running seasonal excursions and dinner trains. The VRS hauls over 25,000 freight cars each year, with nearly 90% of traffic serving Vermont businesses. The company maintains interchanges with: Canadian Pacific, CSX Transportation, New England Central, Central Maine & Quebec, Pan Am Southern, Norfolk Southern, and Canadian National Railway (via NECR), and hosts Amtrak’s Ethan Allen Express, which runs daily between Rutland, VT., and New York City. Their six interchange points allow customers to efficiently utilize a variety of rates and routes that best suit their individual needs. 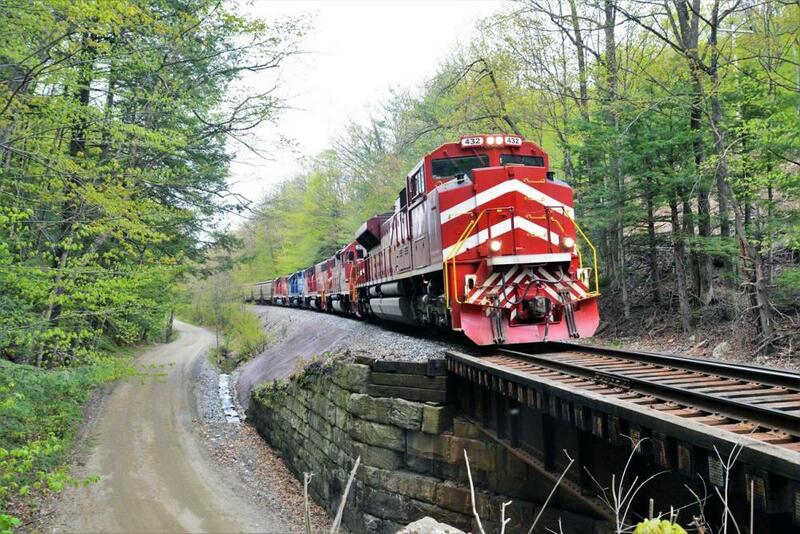 ​ The Vermont Rail System's newest innovation was made in early 2017 when they purchased two SD70m-2 Locomotives, No. 431 and No. 432. The highly efficient locomotives are the most modern in the VRS fleet. They have microprocessor-controlled features that will allow the VRS to move greater tonnage over its lines while using less fuel, ultimately making it more environmentally friendly.